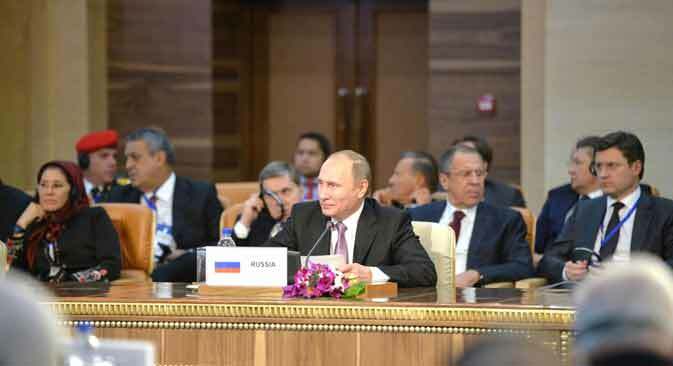 Russian President Vladimir Putin attends the summit of the heads of state and government of the Gas Exporting Countries Forum in Tehran. Russia is planning to increase its natural gas supplies eastward, Russian President Vladimir Putin said at a summit of the Gas Exporting Countries Forum (GECF). "And here, we have very positive work going on with our partners from Asian countries: both with China and with India, with our other partners. We are planning to increase our supplies to Asia from 6 percent to 30 percent to 128 billion cubic meters," he said. Already Russia has a contract to supply 38 billion cubic meters of gas on the eastern route to China; talks are under way over the supply of 30 billion cubic meters on the western route, and pipeline gas supplies from the Far East. "The national energy strategy to 2035 we are now drafting stipulates a significant, 40 percent, increase in natural gas production," Putin said. "Whereas in 2014 we produced 578 billion cubic meters, by 2035 we are planning to produce 885 billion cubic meters," he said. "With our partners from the European Union, we are planning to implement a whole host of infrastructure projects; with Turkey, we are negotiating the southern route," Putin added.